If you’re looking for a quality fire protection company, then there are a few important aspects that you should take into account. You’ll want someone with the experience and knowledge necessary to make your building as safe as possible. That’s why in this blog, we want to help you better understand how to choose a quality fire protection company. Below are the top four things you should consider when you’re looking for a company to handle your fire protection needs. It’s important to look into the history of the company before you decide to work with them. Find out how long they’ve been in business, where they got started, their current office locations and service areas, and anything else you find important. You should also try to find out if they have ever had OSHA citations, EPA citations, or any other issues in the past few years. This is the kind of information you’ll need to make a clear decision. Online reviews and word of mouth reviews are the best way to know how a company treats their customers. Plus you’ll see if their customer satisfaction rate is high and could use a little work. You can also ask for references if you’re considering a company that doesn’t have a huge online presence. As long as you can find out how their previous customers feel about their work, you’ll be able to make an educated judgement call. Because having a new fire protection system installed in your building could take months, sometimes even longer, you will probably work closely with your fire protection company and their employees. Not to mention, you’ll need to call them after the installation for inspection, repair, and maintenance services. So you should try to speak with the employees before you decide to hire them to see if they’re friendly and seem easy to work with. Are your employees OSHA certified? Are your employees NICET certified? How often do you come in under budget? Do you provide up-to-date trainings for your employees? Who will I be working with directly? Are your employees OSHA certified? Yes, we require our field employees to be OSHA 10 Certified to ensure safety on the job. Are your employees NICET certified? Yes, our estimators and designers all have NICET II or higher certifications. How often do you come in under budget? We offer a competitive price no matter what the project (new build, inspections, service, TI, etc). Do you provide up-to-date trainings for your employees? We provide monthly training for all employees. Who will I be working with directly? Depending on the project size, location, and division our customers are provided a dedicated team. Frontier Fire has a 100% completion rating. Are you bonded and insured? Yes, please reach out for more information. 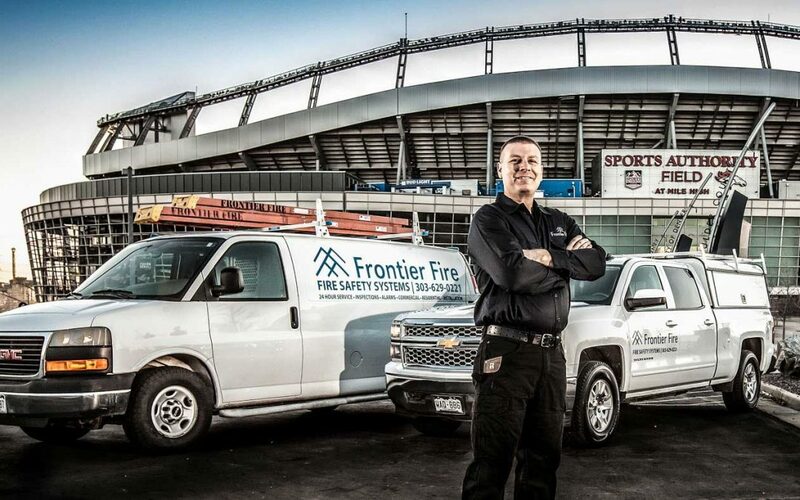 Frontier Fire provides quality fire protection services for businesses throughout Colorado and Utah. Whether you’re in need of an installation, inspection, maintenance, or repair service, we’ve got you covered. Plus we would be happy to answer any of your questions beforehand to make sure we’re the right company for you. If you have any questions or you’re ready to schedule a service, head to our contact page.